Platelets and Aspirin-Induced Asthma is the first book to be published that reflects research conducted on aspirin-induced asthma pathogenesis. It is examined through positions of neuroimmunoendocrine interactions in organism. The Melatonin hormone plays a key role, being the regulator and coordinator of complicated and interrelated biological processes. This new concept of aspirin-induced asthma pathogenesis suggests new methods for treatment of this disease by means of correcting the melatonin content in the patient’s organism. 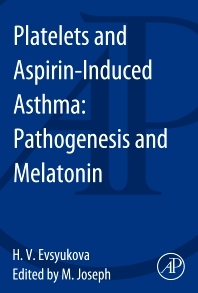 Investigations into the mechanisms of aspirin-induced asthma as a pathology of melatonin producing cells of platelets helps to determine high-risk groups and develop preventive measures and adequate therapy. A multidisciplinary audience; both the clinical audience and the researcher. H.V. Evsyukova is Professor of Medicine at the Department of Hospital Therapy, Medical Faculty of Saint Petersburg’s State University (Saint Petersburg, Russian Federation). She qualified in medicine from the Saint Petersburg State Medical University named after academic I.P.Pavlov. She trained in internal and respiratory medicine, and undertook postdoctoral training at the Departments of Hospital Therapy and Pathological Physiology of the I.P.Pavlov State Medical University. She was awarded PhD and DSc degrees in specialities of pulmonology and pathophysiology in 1992 and 2002. She is a member of the European Respiratory Society (ERS) and European Network on Aspirin-Induced Asthma (AIANE). She has authored and co- authored more than 100 scientific articles, reviews and book chapters including the monograph “Differential diagnostic of lung diseases (selected chapters)”, chapters in books “Allergology”, “Inflammation mechanisms of bronchial tree and lungs, and anti-inflammatory therapy” (Edit. G.B. Fedoseev), “Bronchial Asthma” (Eds. G.B. Fedoseev and V.I. Trofimov), “Hemostasis system” (Edit. N.N. Petrishchev), and also the chapters “Neuroimmunoendocrinology of respiratory organs” in the Manual on Neuroimmunoendocrinology (Eds. M.A. Paltsev and I.M. Kvetnoy) and “Aspirin-intolerant asthma” in the book “Many faces of bronchial asthma: understanding, diagnostics, treatment and preventive care” (Eds. G.B. Fedoseyev, Halmurat Upur, V.I. Trofimov M.A. Petrova). She is the author of invention patent “Diagnostic of Aspirin-Induced Asthma”. The scientific contribution was noted with including her biography into the special edition “Who’s Who in Medicine and Healthcare 2009-2010”.